Your ears are powerful yet delicate instruments. When infection or injury occurs, it can leave you feeling frustrated or scared. At OCEANN in Huntington Beach, California, Dr. Kathy Yu-Syken offers comprehensive ear services to diagnose and treat common ear problems. She also provides thorough hearing evaluations to protect you from hearing loss. Learn more about available ear services by calling the office directly or booking an appointment online. Which ear services are available? If you experience pain, bleeding, or other discharge from your ear, it’s important to seek treatment immediately. Oceann ENT offers same-day appointments and convenient weekend hours to accommodate emergencies. With internal ear infections, you may also experience vomiting, dizziness, or fever. If you develop an ear infection, Dr. Yu-Syken may prescribe antibiotic pills or ear drops. Untreated ear infections can cause hearing loss and severe health complications, so it’s important to receive an evaluation as soon as possible. Tinnitus is a ringing noise in one or both of your ears. The condition is typically due to an underlying ear problem and most often the result of exposure to loud noises. You may also develop tinnitus as you age, or as the result of a misalignment in your jaw joint. Generally, tinnitus isn’t dangerous, but the persistent sound can cause you frustration and anxiety. In most cases, the condition resolves on its own without medical treatment. However, if the ringing noise continues for longer than a week, you should schedule an appointment with Dr. Yu-Syken for a comprehensive evaluation. Do I need to treat excessive earwax? Earwax is your body’s natural ear-cleaning process. It traps dust and debris before it reaches your eardrum. Typically, it dries up and falls out of the ear canal, but in some cases, it may create a blockage that impairs your hearing. If the excessive wax buildup is causing you discomfort, or if your hearing is becoming worse, Dr. Yu-Syken offers safe and effective ear wax removal services. She can also recommend wax-softening drops to care for your ears at home. How do I handle hearing loss problems? If you have difficulty hearing, Dr. Yu-Syken can administer diagnostic tests to identify the cause. She creates a custom treatment plan to determine how to treat the issue, based on the reason. Treatment options for hearing loss include medications, surgery, and hearing aids. Eustachian tube dysfunction occurs when the eustachian tube, which is the thin tube that connects your middle ear to the back of your nose, becomes blocked. The tube helps equalize pressure in your ear and assists in draining mucus. Your eustachian tube may become blocked during a bout with a cold or flu. Nasal allergies are also a common cause of blockage, as is exposure to environmental toxins such as cigarette smoke. Carrying excess weight may also increase your risk of eustachian tube dysfunction due to the build up of fatty tissue around the tiny tube. While these symptoms may resolve on their own after you’ve recovered from your illness, if they linger for a month or more it’s time to call Dr. Yu-Syken at OCEANN for an evaluation. How is eustachian tube dysfunction treated? If you have eustachian tube dysfunction, Dr. Yu-Syken may first recommend conservative treatments to help alleviate the blockage, such as over-the-counter decongestants, anti-inflammatories, or nasal steroid sprays. You may also be able to clear the blockage yourself by pinching your nose and forcibly blowing air through the tubes. If conservative measures fail to relieve your discomfort, Dr. Yu-Syken may suggest an eustachian tube dilation procedure. What is eustachian tube dilation? The eustachian tube dilation procedure is an advanced minimally invasive treatment for chronic eustachian tube dysfunction. During the procedure, Dr. Yu-Syken inserts a catheter through your nasal passage and into your sinus cavity to your eustachian tube. She then carefully aligns the endoscopic device with your eustachian tube and inflates a balloon with water to dilate the tube, which allows both air and mucus to pass through to provide symptom relief. The procedure is painless and you can go back to work the following day. Am I a good candidate for eustachian tube dilation? 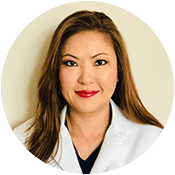 Dr. Yu-Syken determines if you’re a good candidate for the eustachian tube dilation procedure after a thorough examination and review of your medical history. If you suffer from chronic eustachian tube dysfunction, the minimally invasive eustachian tube dilation procedure offered by Dr. Yu-Syken at OCEANN may significantly improve your quality of life. Call the office or schedule an appointment online today to learn more. To learn more about available ear treatments, schedule a consultation online or by phone.